NEW RESEARCH ON immigration related detention and border control in Ireland has highlighted a number of areas of concern, particularly in relation to people who are refused entry to the country and who are subsequently held in prisons here for a number of days before deportation. The report by Nasc, the Migrant and Refugee Rights Centre, is based on more than two years of research and includes interviews with migrants and asylum seekers who were detained due to refusals of permission to enter the country, as well as those detained as protection applicants and pending deportation. People refused permission to land in Ireland can be detained in a garda station or in a prison on the sole authority of an immigration officer or a member of the gardaí, without the need for any judicial approval of detention. The report published today points out that the continuing Irish practice of holding immigration detainees in penal institutions is a subject of international criticism. It also expressed concern about the long periods of time that people are effectively detained in the airport, despite the fact that it is not a designated place of detention. Given the absence of legal safeguards and basic rights, such as access to a lawyer, medical treatment, lack of a real and substantial review of a decision, these detained in the airport, especially those held for protracted periods of time, are effectively detained in a no man’s land and in a setting that sits outside the law. Some detainees appear not to have been put on the next available flight, despite being aware that there were several flights back to their airport of origin that day, and in two cases included in the research, they had offered to pay for their own fare. A young Somali man was held for five hours at the airport before being transferred to Cloverhill Prison. He was refused leave to land because immigration officers at Dublin Airport did not believe he was in Ireland as a tourist, despite his being scheduled to fly back to the Scandinavian country where he had refugee status two weeks later. In this man’s case, there was no flight back to the Scandinavian country from which he had travelled to Ireland that day. He was told he might be removed two days later, on Thursday. He offered to buy his own ticket back home, but was informed “that’s not how it works”. Two men from Hong Kong were refused leave to land at Dublin Airport and held werethere from 11pm until 10am the following day. They were given food and water in the morning, but said they’d had to ask for it. Another detainee, from Ukraine, flew on his Romanian passport (considered a fake by immigration authorities) from Bucharest and had a return flight booked for ten days later. “It is my first time in prison. I am very frightened. There have been many flights every day. Why is it taking so long? For three days I am here,” he told researchers. 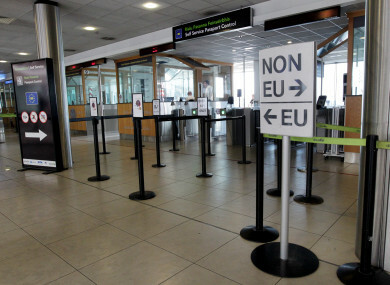 The report notes it is “of serious concern” that individuals detained as a result of a refusal of leave to land are not always returned on the earliest flight to their airport of origin or a connecting hub. “This, as a result, means that these individuals can inappropriately be detained in prisons pending their removal from the state for varying periods of time. If there are other reasons that a person’s removal cannot be affected as soon as possible, this needs to be communicated to the individual as soon as that decision is made and in a language which they can reasonably be expected to understand,” it said. Nasc CEO Fiona Finn said overall the research had found that not much has changed with immigration related detention since the last report on this issue in 2005. “We also need to ensure that those who are being detained are not having their human rights infringed, particularly at ports of entry and in Garda stations, where our research showed that detainees were often left in situations without access to their mobile phones, access to a solicitor or information about the asylum process, access to medical treatment, or access to interpreter services to understand fully what was happening to them,” she said. Work on a dedicated immigration detention centre at Dublin Airport is due to be completed later this year. Email “'I'm very frightened': Stories from people who were denied entry at Ireland's border ”. Feedback on “'I'm very frightened': Stories from people who were denied entry at Ireland's border ”.